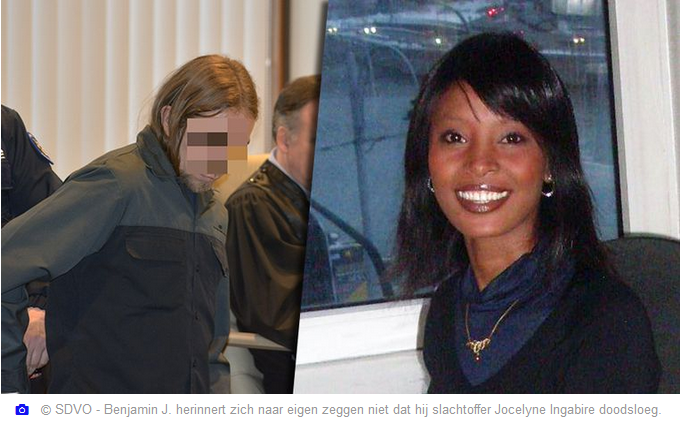 A 33-year-old man from Zeebrugge (Belgium) has been given 10 years in prison for killing his pregnant girlfriend. Benjamin J. has been claiming for 20 months that he no longer remembers anything that happened that evening on 26 May 2017 in his apartment along the Noordhinderstraat in Zeebrugge. According to the relatives, that is unbelievable that he tries to escape a severe punishment. Because of the lack of sufficient evidence that Benjamin J. actually intended to kill his girlfriend Jocelyne Ingabire (33), the public prosecutor’s office nevertheless classified the facts as intentional blows and injuries resulting in death. The result was a trial before the correctional court and not for assizes. The survivors still wanted to remove an assize process for manslaughter, but the court did not respond to this on Monday morning. The judge sentenced Benjamin J. to the maximum sentence for deliberate blows and injuries resulting in death: 10 years in prison. The facts are therefore not light. That night the man had drunk heavily, like his girlfriend, all day long. “I do not remember what happened at all”, the man continues to claim. According to the neighbors, the two got together around 10 PM. Ingabire got heavy blows on her head and the rest of her body during an upcoming fight. “The next morning at 6 am the accused awoke,” said the attorney last month. J. only called his home doctor an hour and a half later. He did not inform an ambulance. The doctor finally came in the afternoon. According to the doctor, he was never told that the victim was in a life-threatening situation. No less than six hours long Benjamin J. was in the apartment while his girlfriend was possibly dead in bed. “He even drank a bottle of wine. Completely incomprehensible. “Ingabire was transferred to AZ Sint-Jan, but was soon declared dead there. The victim was seven weeks pregnant at the time of her death. Benjamin J. claimed that he did not know about it. “I saw a future with Jocelyne and really wanted a baby. I never intended to kill her, “the man said. His girlfriend was of Rwandan descent and saw her parents at the age of ten being murdered. She was eventually brought up by her aunt. That aunt reacted very emotionally during the debates. The court awarded the woman and the other surviving relatives a total of € 30,000 in damages. “It is a relief for her and the other relatives to be able to close this case”, says lawyer Nadia Lorenzetti.